As many people know, on the afternoon of March 11th, 2011, one of the world's richest countries was ravaged by the largest earthquake in its recorded history. Minutes later, as the inhabitants of the Tohoku Region were still recovering from the shock, a tsunami - well over forty feet high - struck the coastline, demolishing everything in its path. Tsunami escape areas, supposed safe zones, were inundated. Hospitals full of the sick and schools full of children were submerged. Trains full of passengers were knocked off their tracks and buried in the seawater. Entire villages were erased from existence. In the town of Minamisanriku alone, more than 9,500 people went unaccounted for (most of these had simply fled or were scattered, but more than 1,000 were killed). To add to the apocalyptic nature of the disaster, a nuclear meltdown began at numerous reactors at a plant on the Fukushima Prefecture seashore, spreading fear of radioactive contamination the world over. In less than an hour, the world's third largest economy was facing - as Prime Minister Kan described it - the biggest crisis since World War II. "That night," as one family near Shizugawa City recalled, "it was pitch black. You could see nothing." As we sat in their new home - a hut constructed from the rubble - the Takahashis gave us the harrowing details. They were the owners and operators of a bed-and-breakfast-style establishment (minshuku). On the day of the disaster they watched from the hills above as their cherished family business was wiped off the seashore. At the Dougenin Buddhist Temple, a remarkable site on the mountains above the port town of Ishinomaki and an active religious center of more than 850 years, the priest and his wife hosted 800 survivors that night, using their stock of blankets and futons to keep the crowd warm in the wintry blackness. "All that you see down there," Mrs. Ono said to me, pointing at the semi-lit portion of town that stretched across the miles of tattered plain below us, "All of that was pitch black. The tsunami washed it all away. " 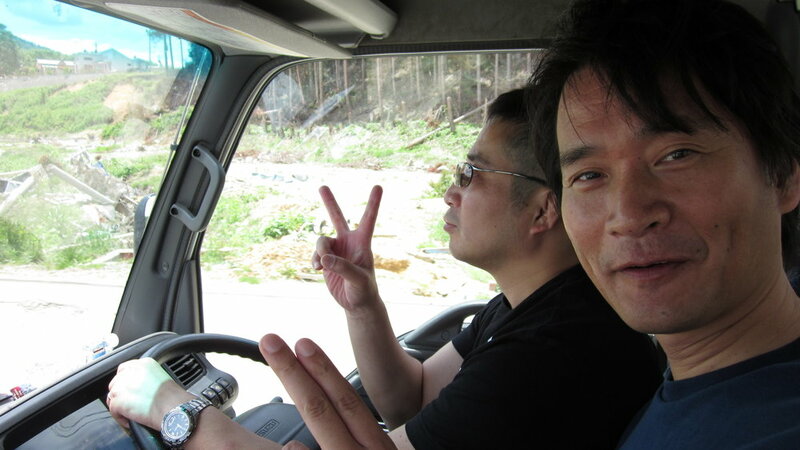 Mr. Torihata, the owner of a truck-driving business and a long-time resident of Minamisanriku, wept as he drunkenly asked us, "Why couldn't my friends have run away from the tsunami? Why didn't they get out?" He slammed his fist on the table, and questioned us further, "Why do I get so emotional?" Mikata Sho, a middle school student and kendo athlete, chuckled as he told me that the only thing left standing of his house was his toilet bowl. Having seen much of the disaster via YouTube videos and online newscasts from the comfort of my dorm room in Cambridge, Massachusetts, I was aware of its extent, but only in a semi-conscious kind of way. It wasn't until I stood next to the central hospital in Shizugawa (Minamisanriku), with its entrance pillars wrapped in steel bars from some foreign building, its back balcony with a fishing boat on it, and its highest windows - at over thirty-five feet - shattered with debris protruding into the sky, that I comprehended the power of the wave. 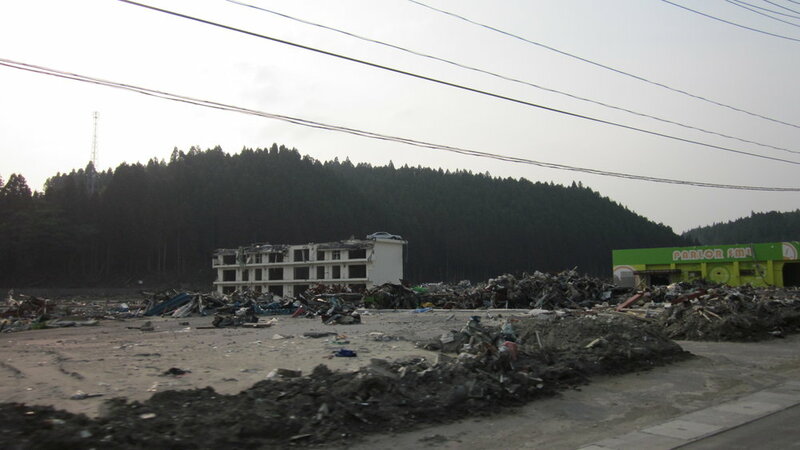 I found out later that about 80 people had perished in the hospital on the day of the tsunami. A bouquet of flowers lay next to the front entrance in silent memory. I had been sent to the region by the Reischauer Institute of Japanese Studies at Harvard, as one of a few student volunteers. Assigned to work in Minamisanriku with a grassroots group called O.G.A. 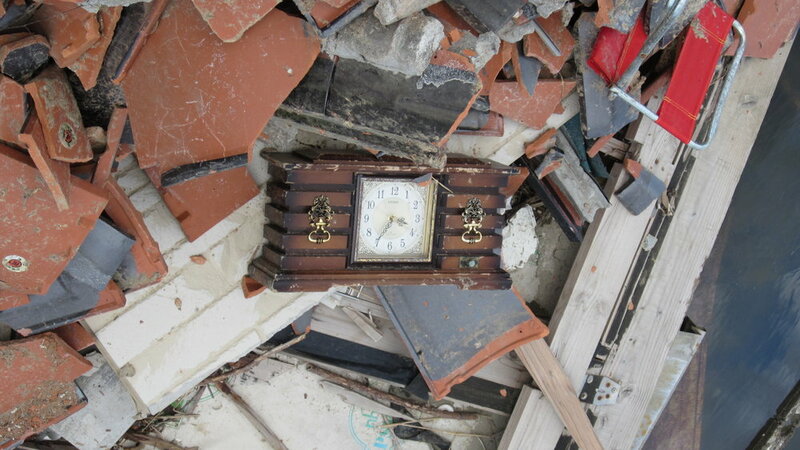 for Aid, I found myself in the heart of the disaster zone, carrying camping gear and my violin. To my surprise, I was given a futon and a small apartment room next to the Hotel Kanyou, which was acting as a temporary housing location for about 500 survivors. So much for the camping gear, I thought. Yet I soon discovered that staying at the hotel was not that different from staying at a campsite. For one thing, as the waterworks for the city was still incapacitated, the survivors were relying on Japanese military (jieitai) trucks to deliver fresh water each day. At about 12 AM each night a huge tanker would pull up in front of the hotel to make its delivery. This provided bathing water, but water was still unavailable in the taps and in the toilets, meaning everybody was using the portable toilets outside. I was happy to have a roof over my head, though, which was certainly more than many could have said during the weeks after the tsunami. As for how music related to all of this, I was asked on numerous occasions to perform, either during our off-hours (at the hotel or at survivors' residences) or during events sponsored by volunteer groups, such as free public barbecues, etc. I had come prepared with a repertoire of simple and familiar tunes, including many Japanese folk and popular songs. 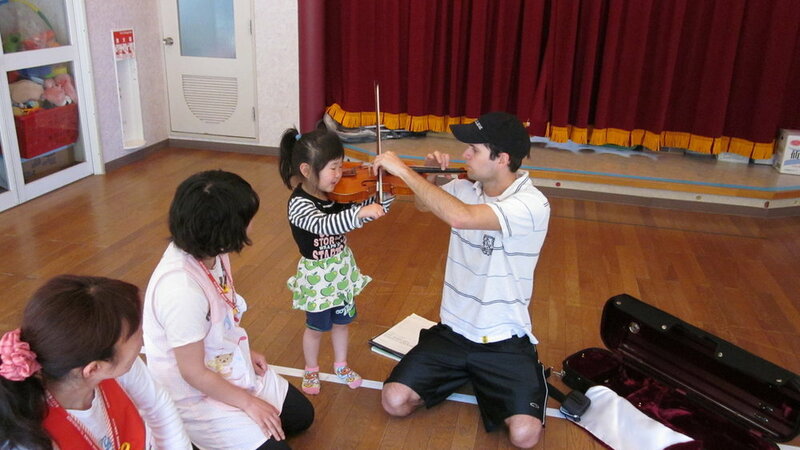 Most of the people who heard my performances were hearing a nama ("raw" or "live") violin for the first time. One such example happened on a dark and foggy evening, as we sat with the Takahashi family (the minshuku owners mentioned earlier). Early in the evening, they lamented their situation. "We risked everything for that business. We started with loans, and worked for decades to pay them off." Their minshuku bus was left in a ditch - a crumpled piece of debris. They had managed to scrape the gold lettering off its side. The lettering adorned their hut window - a gesture both tragic and hopeful as they began to think about rebuilding. But as Mr. Takahashi explained, they wanted most of all to not have to rely on the volunteers for survival. They had demonstrated their amazing survival skills in many ways: their freezer, on its side, was now acting as their bathtub; their walls were insulated with futons and blankets; their front "yard" was decorated with flowers, landscaped with chopped-up cherry-tree logs (trees which used to draw large numbers of guests at their minshuku each spring for their blossoms), and illuminated by solar-powered lights. They proudly pointed to the two pine trees in back, which still stood (though barely), and explained how, as the trees have been around since before World War II, they have survived the two great calamities in Japan of the past 100 years. The gods reside there, they said, watching over us. As the conversation waned, the family's attention turned to the violin. "Play!" they urged me. So there, in the smokey and dimly-lit hut, I played tune after tune, each of which promted a new response. The American-flavored Ashokan Farewell brought a hush to the air. Okinawa's Nadasousou seemed to bring a sense of great nostalgia. Amazing Grace offered a slightly more hopeful atmosphere, which was illustrated by the change in conversation following. Mr. Takahashi had seemed to forget briefly the things he had mentioned just minutes earlier, even joking that were it not for the tsunami, they would have never heard a violin in their home! Others that heard my playing were not so new to the instrument, or to the classical Western tradition, in any case. One was a woman named Mrs. Sato, who heard me play in the streets of Tomarinohama during one sunny afternoon crafts activity. She said her daughter was a pianist, and that she never imagined she would hear beautiful music in that place. She seemed particularly touched by Bach's Gavotte en Rondeau, from the E-Major Partita. The grace and the lightness of the rondo theme in that piece seemed to reflect Mrs. Sato's countenance exactly as she stood there on the road above the ocean, poised against the destruction that lay between her and the water below. Another who was familiar with music of both Japan and the Western tradition was the mother of Sho Mikata (the owner of the surviving toilet seat mentioned earlier). She was a teacher of a pre-school/day care center for employees of the Hotel Kanyou. Her assistants gathered the children together to eat while listening to my violin. I asked if any of them played piano, and two or three of them said they did, but that their pianos had also become victims of the tsunami. After showing some of the children how to play Twinkle, Twinkle, Little Star on the violin, I proceeded with some of my repertoire, including another Bach Gavotte and Dvorak's Humoresque. Closing off the brief performance, I played Gonoud's Ave Maria, with Mikata Sensei singing along. Silence followed, and I knew that something beyond words had transpired. We had been taken to a better place - somewhere beyond the Hotel Kanyou and its smell of rotting debris and portable toilets. Near the end of my time in Tohoku, I was asked to perform at some ceremonies marking the 100th day since the tsunami at a Buddhist temple in Ishinomaki. It was here that I witnessed people's true emotional reaction to the disaster. For the first time, people openly wept as I played tunes like Natsu no Omoide and Koja Misako's Warabigami. As I played, the mother of the temple read poetry written by children about the tsunami. Afterwards, she asked me if I would be willing to perform inside the temple sanctuary, where a funeral service was being held to honor a woman who had perished in the wave. I was truly honored, and gladly performed for the Abe family to help them remember their grandmother. That night, as I stood in the temple graveyard overlooking the ruins of Ishinomaki, the earth shook. It started slowly - a deep groan in the depths of the mountain. Soon the gravestones around me started chattering. A few seconds later I felt myself get up and start running for a clearing. I lost my balance as I went, and ended up crouched between a row of gravestones as the shaking climaxed, relaxed, and then died away slowly. I sat there in the dark, heart pounding, for a long while, as I comprehended the reality of the power of the earth in motion. It was hard not to imagine another tsunami pouring into the city below. From the temple sanctuary, I can see the ocean. As I worship, my breath escapes me. I do not notice myself sighing. The Buddha is surely watching. The sound of my breath becomes the wind. The sound of my breath becomes the great wind. And take me away with you. From the temple sanctuary, I saw the tsunami. With no thought of worship. They did not notice themselves panicking. The Buddha was surely watching. The sound of their breath becomes the wind. The sound of their breath becomes the great wind. The power of her words (certainly more powerful in Japanese), and her shaking voice as she read them on this - the 100th day since the disaster - struck me to the core. Here I was, a poorly-dressed volunteer, at one of the most sacred spots in Japanese culture, receiving a gift, a creation, of true beauty; something created from a heart in shambles. She told me that she was carried away in thought during the Allemanda, and that the music had provided the stimulus for her poetry. I found this astonishing. The Allemanda, a piece written by a Christian composer sometime between 1717 and 1723, had become a catalyst for the creative words of a Twenty-first Century Buddhist priestess, struggling to cope with the circumstances in which nature had placed her. I was merely a vehicle in this strange, timeless process. Something far greater than my performance had just taken place. 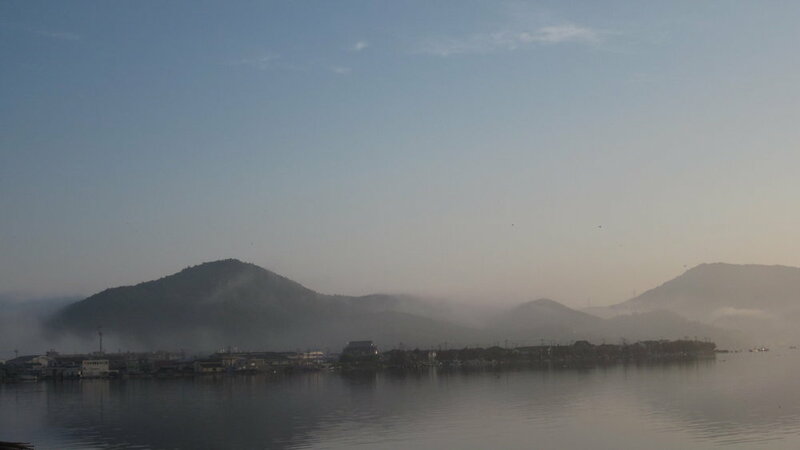 The next morning, the sun rose over the temple and over the remains of Ishinomaki. My British friends (who had been supportive of O.G.A. for Aid and brought truckloads of goods from Tokyo) and I discovered that the town was again flooded, in places that were dry only 12 hours before. The earthquake of the previous evening must have shaken some more water up through the soft riverbanks, we concluded. A Jieitai officer looked puzzled as he examined the portion of the road we were attempting to cross. We passed through cautiously, waved to the officer, and were soon on our way to Sendai, my point of departure. I thought a lot about what music had accomplished as I sped through the Japanese countryside on the Tokyo-bound shinkansen. On the one hand, it had not done much. Some people might have noticed my playing at the Kanyou Hotel. Some might have enjoyed the entertainment while they waited in line at the public barbecues. More likely, most of them have probably forgotten the violin was even there. Most of them were much more excited by the fresh fruit and the bottled water we delivered. However, for those few individuals who listened intently, there was more than a mere pleasure. For individuals like Mrs. Sato, Mrs. Mikata, the Takahashi family, the women in the Hotel school, the bereaved Abe family, the people at the 100th-day ceremony, and for the Ono couple, music seemed to provide an escape - a breath from the drudgery of recovery; a breath that just might have been the "great wind" on which they could ride to a better place. With O.G.A. 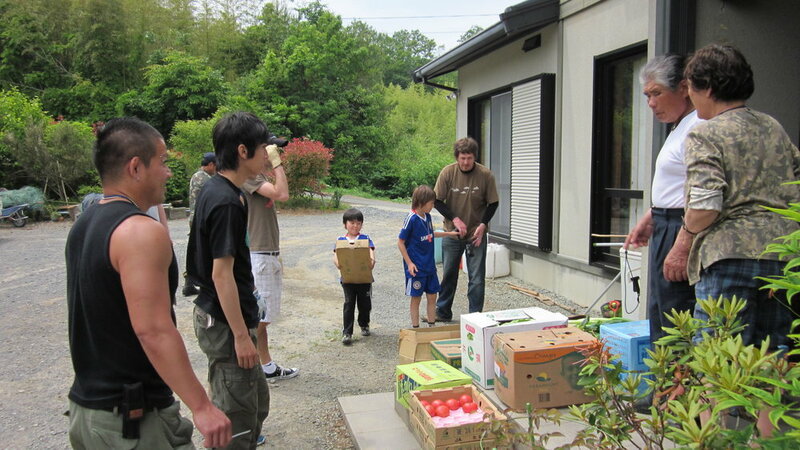 for Aid’s Kei Watanabe and a Hotel Kanyou associate, Choki Abe, delivering goods to a temporary living facility.